ProCarton ECMA Award 2016 für Gerlinde Gruber für Pago Sampling Fixierung aus Karton. Ausgezeichnet als MOST INNOVATIVE CARTON of the year! Meine Pago Samplingfixierung wurde am 15. September 2016 mit dem Special Award MOST INNOVATIVE CARTON beim ProCarton ECMA Award ausgezeichnet! Ich bin sehr stolz auf diese Auszeichnung. The idea started off with the customer looking for a new way to fixate sampling bottles. The focus was on replacing the adhesive tape which had so far been used to fixate the sampling bottles in the crate, whilst supporting branding at the same time. The reason being that the solution with the adhesive tape was time-consuming and always looked somewhat untidy. Now the sampling bottles can be secured during running production and without slowing down the production line. 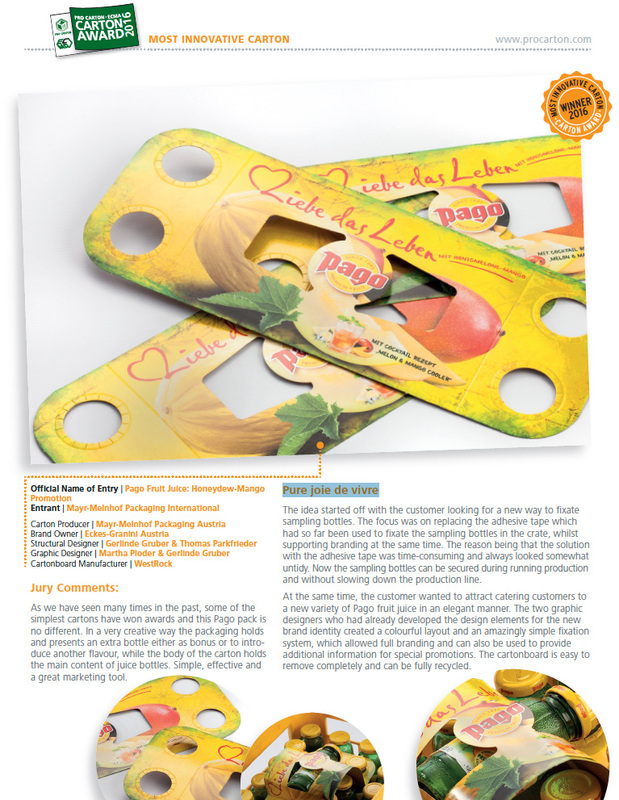 At the same time, the customer wanted to attract catering customers to a new variety of Pago fruit juice in an elegant manner. The two graphic designers who had already developed the design elements for the new brand identity created a colourful layout and an amazingly simple fixation system, which allowed full branding and can also be used to provide additional information for special promotions. The cartonboard is easy to remove completely and can be fully recycled.